On a chaotic day in March, sometimes it helps to have an Angel. And a Sheldon. Senior guards Angel Rodriguez and Sheldon McClellan combined for 44 points to help their Hurricanes avoid an upset against No. 14 seed Buffalo on Thursday, taking care of the Bulls, 79–72. 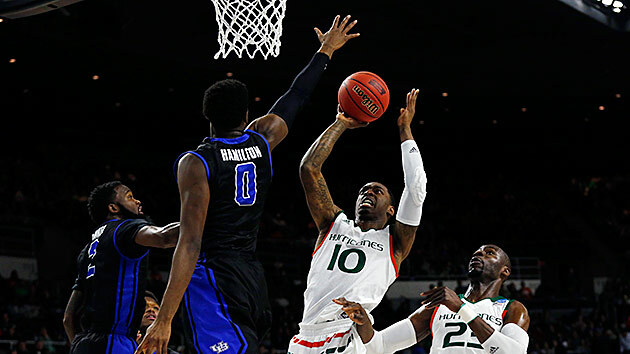 Lamonte Bearden led the Bulls with 19 points on 7-of-16 shooting and hit a tough shot in the lane to cut Miami’s lead to four points with 1:45 remaining as part of a 12–4 run. But Bearden missed a three on the next trip down the court before two Rodriguez free throws helped diminish the Black and Blue threat. In the tournament for just the third time since 2002, Miami showed why it could provide one of the toughest tests for overall No. 1 Kansas in its region. McClellan had a double-digit night for the 21st straight game while Rodriguez scored a season-high 24 and ignited the offensive unit. Those two will drive the Hurricanes however far they go, but their big men also proved up to the task. An average rebounding team on the year, Miami outrebounded Buffalo, 44–31. The Canes also showed the mental resolve on which one of this year’s most experienced squads can rely. Everything went Buffalo’s way in the opening minutes as the underdog opened up a 12–4 lead, but Miami regained control with a 7–0 run later in the period and never really let go. Miami will face either No. 6 seed Arizona or No. 11 Wichita State on Saturday in Providence.